My new layout is an around-the-walls style layout, with a peninsula coming from one end of the room. I decided to build the layout on shelf brackets screwed into the wall studs, with shelves cut from 4×8 foot sheets of plywood. This way, I would not have legs under the layout, leaving room for storage of my model railroad equipment and railroad ephemera. I started by deciding what height to make the layout. As I mentioned before, the whole layout is on one level. Most people say you should build it somewhere between belt height and shoulder height. I chose a height of about 44″ from the carpet to the top of the plywood. 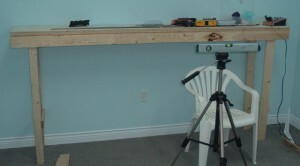 I wanted it a little on the low side so kids would have a chance of seeing what’s on the layout with a little stool. After borrowing a friend’s stud finder, I set about marking where the studs were on the walls with a pencil. 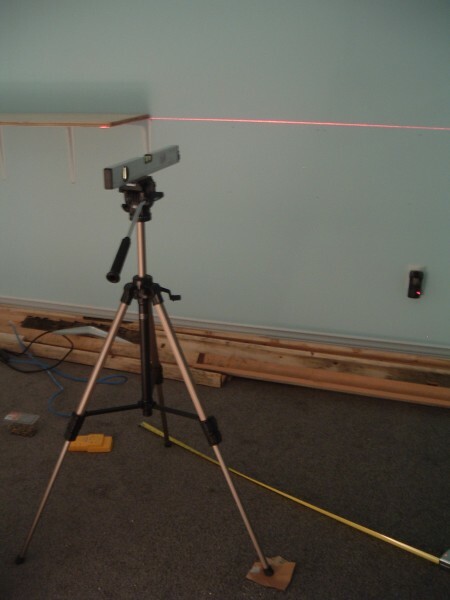 I used a laser level on my tripod to make sure I was building the layout perfectly level. In the corners where I couldn’t get supports in, I used little metal connectors to screw the two boards together and prop up pieces of plywood I cut to fill the corners. I reasoned there wouldn’t be much weight there so they didn’t have to be as strong as the rest of the layout. For the end with the peninsula, I built a traditional box structure and put legs on it. The peninsula is going to be on legs and I figured it would need a firm, rigid structure to attach to. I haven’t built the peninsula yet, since my layout room is doubling as a spare bedroom for a few more weeks. Soon, soon! So far I’m very happy with the method I used to build the layout. It has made tracklaying a breeze and I appreciate the rigidity of the structure. The NSER was built on legs, and wasn’t attached to the walls, so it was a little wobbly until the whole thing was built. This layout is rock solid.